Sorry it's been so long since I posted to the blog. What can I say. We've been very busy. Tomorrow, if you're interested, you can join me at 1 pm for a presentation on growing succulent plants at the Portland Nursery on Division (9000 SE Division St. in Portland). Even if you've been to another class I've given, no two are the same as I try to direct my comments to the needs of the people in attendance. You can register for the class here. 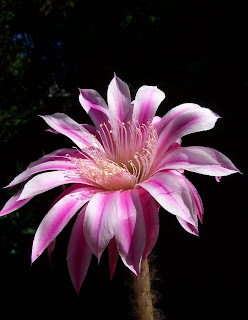 And Echinopsis 'Barber Pole' flowered again this week.